When Jolie put up a temporary Pho Keene Great coming soon sign in the window in December, the city asked her to take it down. The city of Keene has been in the spotlight over the name of a new Vietnamese restaurant coming to town. Some find it offensive, some find it funny, and others are wondering if there’s more to the story than meets the eye. Editor’s Note: We recommend listening to this story. Isabelle Jolie is one of the restaurant’s owners. She used to run a local food truck on the outskirts of Keene. But she and a couple business partners signed a lease last year to open a new, full restaurant downtown. She said it’s been a big project -- all the renovations and planning. “Oh yea, we put a lot of money into it,” she said. She chose the name for this new venture almost by happenstance. She knew she wanted the word “pho,” a popular Vietnamese soup, in there, plus Keene, where the restaurant would be located. But beyond that, she wasn’t sure. She ran the idea past a friend. So that was it: Pho Keene Great. There’s even t-shirts she made as a marketing tool last year, the name in bold lettering below a cartoon of a Vietnamese woman eating noodle soup. 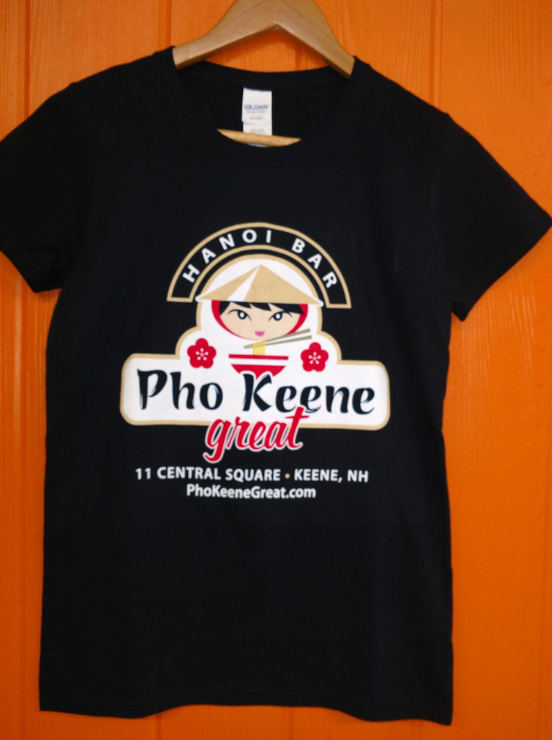 A local gift shop was selling hundreds of Pho Keene Great t-shirts a day as of last week. Jolie says it’s really not offensive -- after all, it doesn’t sound bad at all if you say it with the proper inflection. The rules applying to this restaurant are different than most other businesses in town, said Keene City Manager Elizabeth Dragon. That’s because Jolie’s not leasing from a private landlord, but actually the city itself. The space she leased is actually in the same building as city hall. The terms of that lease give the city the right to approve or deny what goes up on window lettering or signs, Dragon said, including something that could cause complaints or be offensive. “I think a lot of people are confusing it with first amendment rights, but it’s really just about the lease,” she said. The whole kerfuffle, though, hit the news around the holiday and then went viral, spreading to news outlets across the country. Jolie’s t-shirts started flying off the shelves, several hundred a day as of last week. A group of eight American soldiers in Afghanistan even put in an order, she said. The thing is, if you’ve been living in New Hampshire for a while, you know this isn’t the first time an off-beat story from Keene has hit the national news. 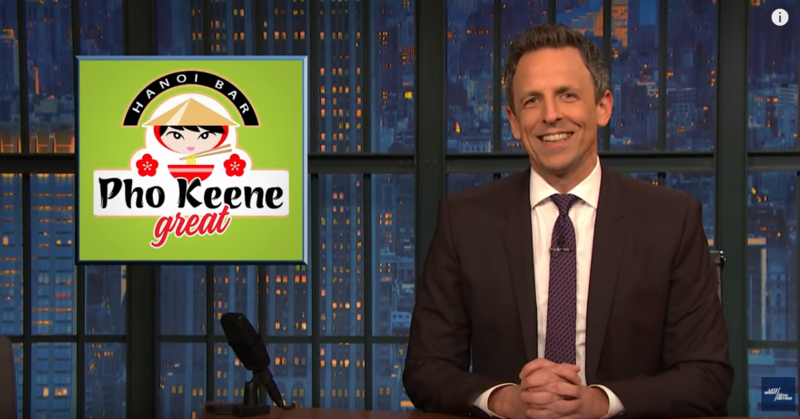 Late night host Seth Meyers included a bit on 'Pho Keene Great' in his show January 9. There was the time the city’s traditional fall pumpkin festival devolved into riots. There’s local characters like the ‘Crying Nazi,’ the ‘Redneck Muslim,’ and the libertarian ‘Robin Hooders’ who went after meter maids downtown to keep them from issuing parking tickets. Connected to a lot of these stories in some way is a man named Ian Freeman, a general gadfly of many in city government. He’s the same guy, it turns out, who’s behind the organization that owns the property where Jolie had her original food truck and where the gift store sits that’s now selling her t-shirts. Freeman’s a vocal libertarian, a former Free Stater, who hosts a radio show, Free Talk Live, and runs a blog, Free Keene -- now titled Free Keene Great. Jolie’s t-shirts are linked to, by the way, quite prominently on that site. So, all that, combined with the fact that the Pho Keene Great sign would, to some, appear to mock the city while sitting right next to City Hall, is leading to questions about whether the whole thing is an elaborate set-up, a prank of some kind. Local Keene radio host Dan Mitchell grilled Isabelle Jolie on it last week. “No, absolutely not,” she responded. Freeman, for his part, said any suggestion along these lines is a conspiracy theory, ridiculous. And Jolie agrees. She’s just trying to open a restaurant, she said, and she’s already invested a lot of time and money in the process. City Manager Elizabeth Dragon declined to comment on any connection to the local libertarian movement. She’s gotten a lot of response on both sides of the issue from far beyond Keene. The city will likely come to a decision on the restaurant’s application for a sign, hopefully settling the name issue, later this week, she said. The City of Keene is asking a Vietnamese restaurant slated to open this spring to change its name. The restaurant has a lease with the city to operate out of the same building as City Hall. But its proposed name, Pho Keene Great, has prompted complaints, said City Manager Elizabeth Dragon. Pho, pronounced “fuh,” is a kind of Vietnamese soup. “Pho Keene” is intended to sound like a profanity, Dragon said. A Bitcoin Embassy, where people and businesses can learn more about the cryptocurrency, has opened its doors in Keene. The University System of New Hampshire has selected Melinda Treadwell as the next president of Keene State College. Treadwell has been leading the school on an interim basis since the unexpected departure of former president Anne Huot last summer. She has overseen significant cost-cutting and restructuring efforts. Like many colleges in the region, Keene State has struggling with enrollment declines. Treadwell is an alum of the college and a former faculty member. A New Hampshire man is suing Howie Carr, accusing the conservative radio host of violating a no-contact agreement and attempting to hack into his Uber account. Jared Goodell of Keene, who according to social media posts served as operations manager for the Howie Carr Show from 2016 until February of this year, recently filed a complaint in federal court in Concord. He’s seeking damages of more than $800,000.